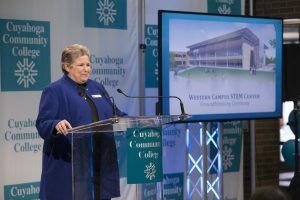 A groundbreaking ceremony for Cuyahoga Community College marked the beginning of construction on an extension for West Campus. 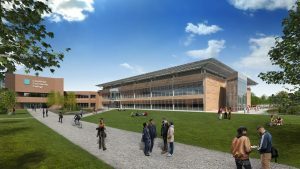 The approximately 60,000-square-foot STEM Center will host expanded curriculum in science, technology, engineering, and mathematics beginning next year. The $34 million addition is the first major project to begin after Cuyahoga County voters approved a $227.5 million bond issue, commonly known as Issue 61, in November 2017. More than 200 people attended the event in the North Atrium, where television screens provided a live view of the snowy site of the future STEM Center, just northeast of the existing campus building. Speakers at the event included school officials, local mayors, and representatives from construction and architectural firms involved in the project. West Campus President Donna Imhoff said modernization of facilities will help offer new ways for students to learn and collaborate with state-of-the-art technology. “It is important that the latest and the newest techniques should be taught,” Imhoff said. When classes begin in the STEM Center in Fall 2019, Imhoff expects the quality of classes offered will rival those of major four-year universities. In remarks during the ceremony, Imhoff thanked everyone involved in planning talks for the STEM Center. She said those months of planning meetings involved school officials, architecture and construction firms, and department heads. “We had everyone involved who needed to be involved so that the best building will be built with the best facilities,” she told The Voice after the ceremony. Multiple speakers praised county voters for approving a $227.5 million bond issue in November 2017, something Johnson interpreted as a vote of confidence for the college.“We have not asked this community for any support for renovations and physical improvements in the history of the college, and that’s been 54 years,” he said. Other speakers expressed faith in the school and started design work before funding had even been secured. Clete Miller, of architectural firm Weber Murphy Fox, said his company spent about 18 months designing the new building before voters approved Issue 61. “We believed that the levy would pass and that the Cuyahoga County residents would support the college because it has such a great outreach and is such a great benefit,” Miller said. Several other construction projects are expected to begin later this year, upcoming projects include expansions at Westshore and Metro campuses.